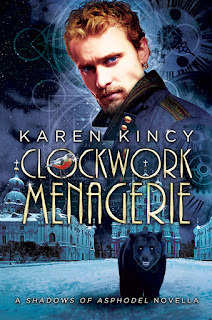 Released on September 1st, 2015, by Curiosity Quills Press, Clockwork Menagerie by Karen Kincy is a novella in the Shadows of Asphodel series. This one plugs into the series at #2.5. I've read the first book, and I Kickstartered the second, when they were being self-published. I haven't actually read book two yet though! Call this one "Historical-fantasy romance" (the publisher does). It's got that dieselpunk aesthetic with a big dash of romance and magic to liven things up. 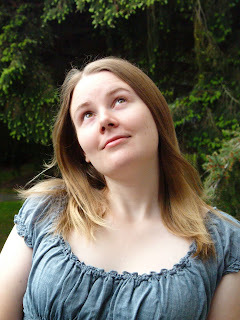 I'm really happy to be hosting a stop on this novella's blog tour. Clockwork Menagerie is available now! 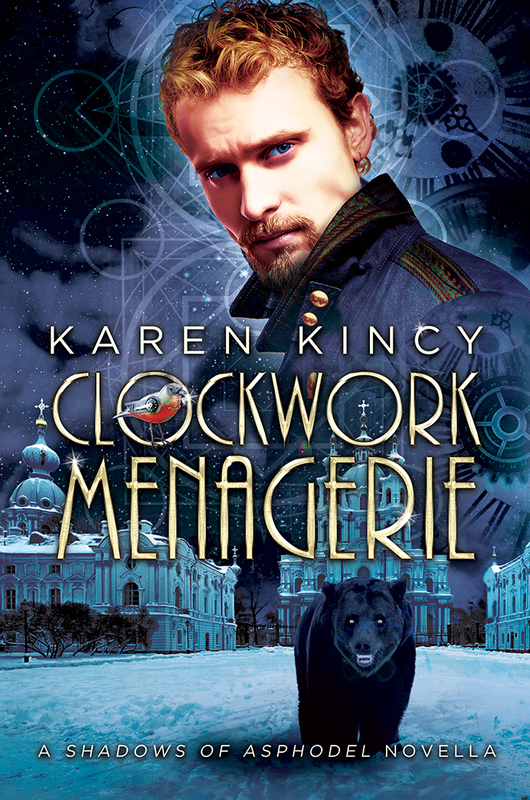 Clockwork Menagerie is a dieselpunk romance set from the perspective of Konstantin, an Archmage who appeared earlier in the Shadows of Asphodel series. I don't have any strong memories of his role in earlier books, but his personality--quite reserved, quite focused on his job--felt very familiar. This book sends Konstantin directly into danger, on a diplomatic mission. It seems a bit absurd as the people in his life all agree he cannot tell a lie nor is he particularly diplomatic. Still, off he dutifully goes. Of course, along the way, Konstantin faces his attraction to the handsome zeppelin commander Himmel. Himmel's clearly captivated by Konstantin, and does what he can to protect him from, well, the consequences of Konstantin's naive choices. Can I take a pause right now to underline how much I love Konstantin in general? He's so focused on his work that he sometimes ignores the bigger, broader picture, and his reactions when he's confronted by that made me smile. There's quite a bit of heat in this book--if you like your romance m/m, there's a few scenes that will make you smile. I loved the dynamic between Himmel and Konstantin--there's some intriguing power exchanges going on here, not only in their intimate relationship but also in their professional lives. One of the highlights of this book, and the series, for me is the dieselpunk component. I love the way that diesel, magic, and clockwork bits and bobs are woven together to create an intriguing world at war. I don't often read dieselpunk (okay, truth, I'm not sure I could even name another dieselpunk book that I *have* read), but this book made me wish I did because I really like the aesthetic. I felt a little lost reading Clockwork Menagerie, having not read the first book in a while, and never having read the second. I think if I'd been more connected to the story surrounding/preceding this novella, I would have been that much more into it. There's lots of elements here that I really liked though, and I recommend you grab a copy--but first read the first two Shadows of Asphodel books!